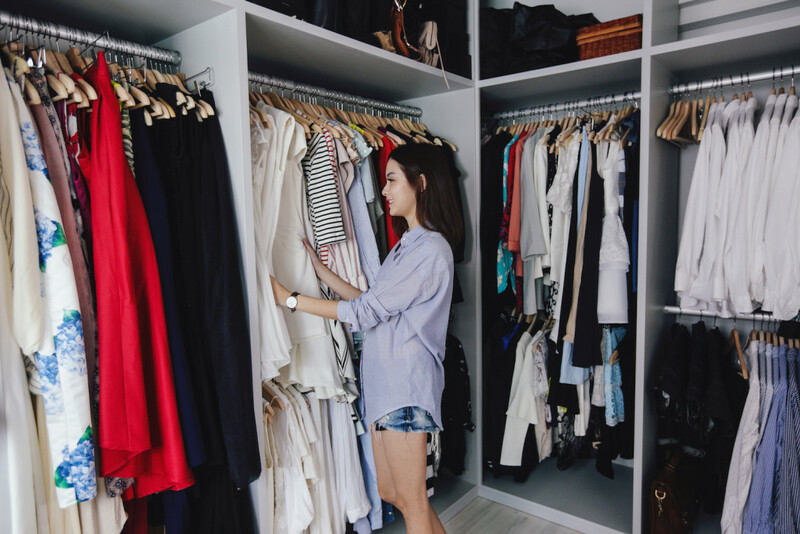 Jessica Tham, or @tippytapp as she’s more commonly known by, is no doubt one of the more popular fashion bloggers in Singapore – so it’s no surprise that her walk-in wardrobe is the stuff #closetgoals are made of. 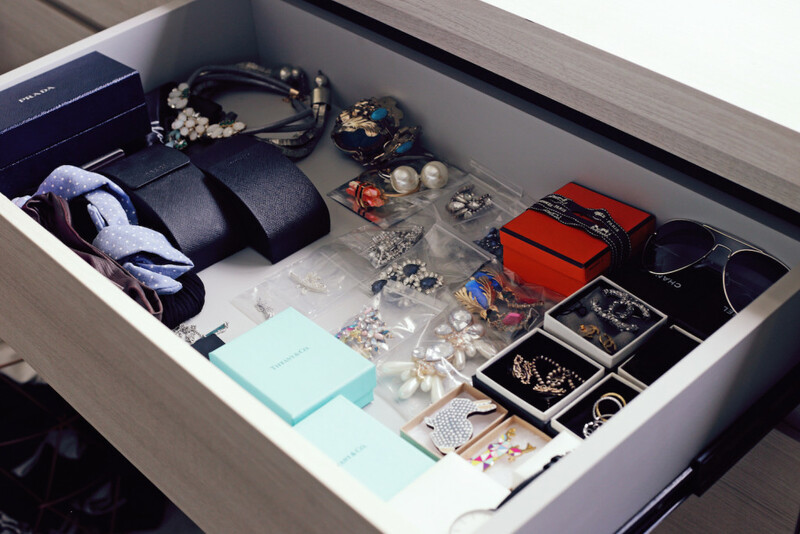 We explore her Pinterest-worthy wardrobe and get her to share organisation and storage tips. When we first show up at Jessica’s new place in the morning, she greets us cheerily and she lets us in. Almost too cheerily for 9.30am in the morning. I mean, how does this girl look so fresh and glowy in the morning?! As Jessica gets ready for the shoot, we explore her new apartment which she shares with her husband Silas. The interior has a classy Scandinavian theme, with carefully thought-out details in almost every nook and cranny. Here’s Jessica looking fab (yes, even with the house slippers) while getting ready for the shoot. We spot a delicate birdcage-like light hanging by the door and marvel at it. “I got that from Taobao,” Jessica says, looking pleased with herself. “Actually, I got most of the lights in this house from there. So much cheaper, even with the shipping cost!” Jessica, if you didn’t already know, is a Taobao addict and has a knack for finding the cutest things on the site. Finally, we get down to business and head over to her walk-in wardrobe, which she shares with her husband Silas. 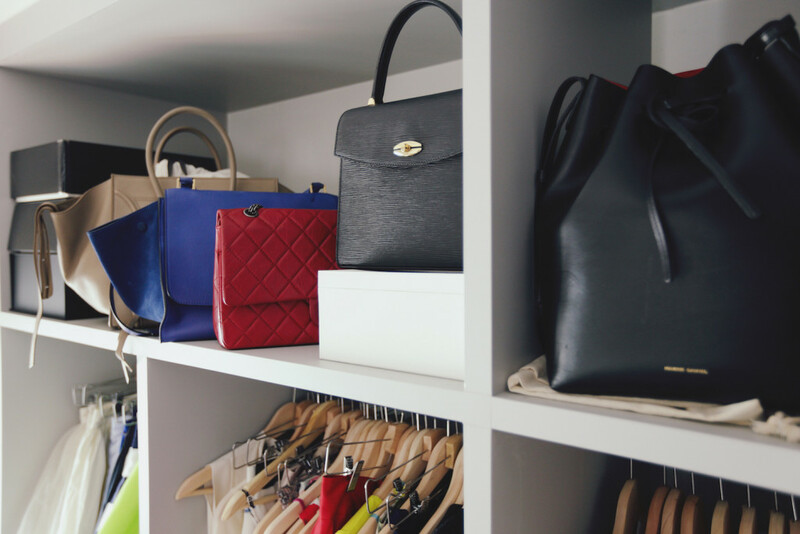 “But where’s Silas’s stuff?” we ask, as we take in the rails of pretty dresses and shelves of designer bags. When it comes to bag storage, Jessica prefers to display her bags instead of keeping them inside the dust bags. This way, she gets a better idea of what options she has to match with her outfit of the day. To maintain the shape of softer bags, stuffing your bag is essential. Instead of stuffing it with loose bits of wrapping tissue, a neater way would be to put the stuffing inside the dust bag then stuffing your bag with it. This way, you won’t have random pieces of wrapping tissue falling out whenever you want to use a bag. If you prefer to keep your bags inside their respective dust bags, another way to keep track of what you have is to make a catalogue on your phone with individual photos of each bag. That way, you can scroll through the catalogue when you’re deciding on what outfit to wear for the day. Leave bags you use more often on a table or shelf for easy access. It’s better not to hang them, as this may cause the leather at the handles to stretch over time. 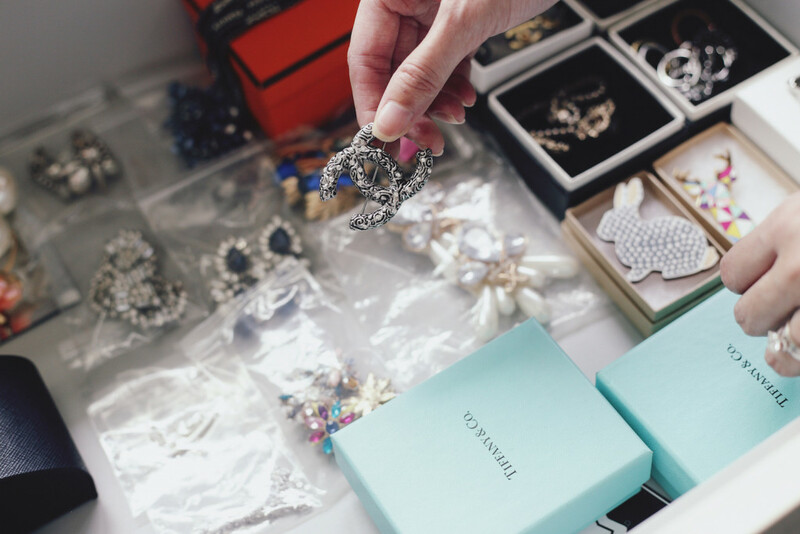 To store smaller accessories like earrings and brooches, Jessica places them in clear plastic ziplock bags (which you can get from Daiso) to keep them clean and tidy. You can also place accessories in boxes (with the lids open) so it’s easier to see everything at one glance. 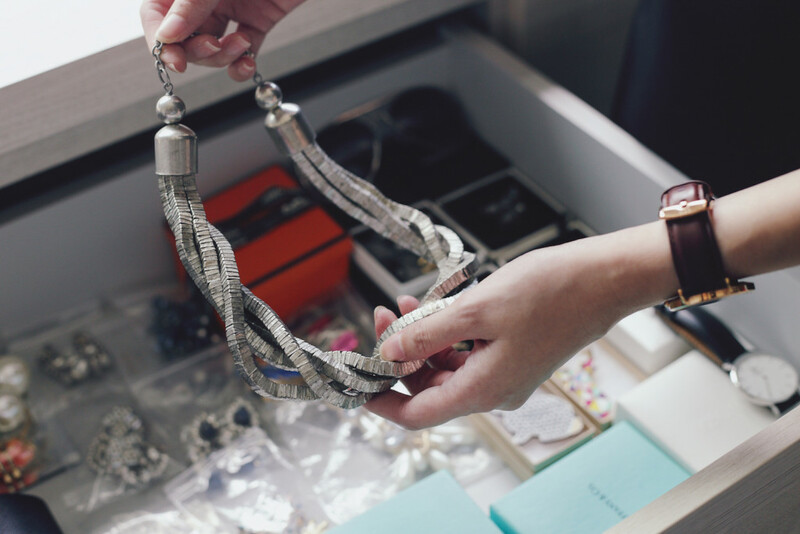 If you have delicate or dangly necklaces, try an acrylic drawer with a velour dividing tray. For bulkier statement necklaces, store them in transparent ziplock bags instead – this will make it easier for you to stack necklaces without getting them tangled and whatnot. To maximise shoe storage, try to get shelves or racks that are adjustable (in height). This way, you can adjust the shelves to accommodate varying shoe heights. 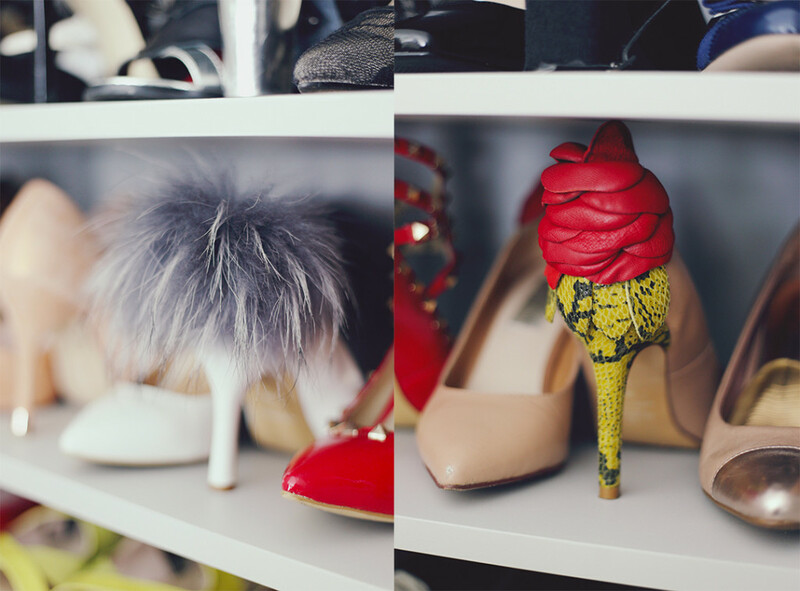 Jessica keeps her shoes organised by height, so each shelf is fully made use of. It also makes things much easier when she’s trying to decide what shoes to wear while rushing out of the house. You can’t really see in this photo, but the bottom shelf contains Silas’s (very few) shoes. “He chose that shelf okay! He said that since his shoes aren’t as nice as mine, he can just hide them at the bottom.” How commendable of you Silas, not to deny a girl valuable shoe space. For heels, Jessica places one side facing outwards and the other facing inwards. 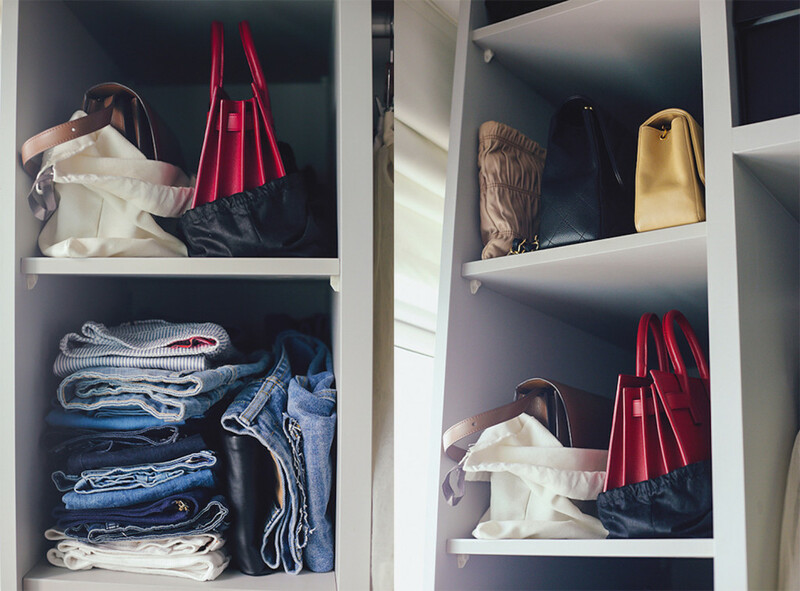 Doing so can help you save enough space to accommodate at least one more pair of shoes per shelf – and extra shoe space is always welcome right? To prevent your shoe closet from smelling musty, place dryer sheets in the pairs that you don’t wear often. The dryer sheets will help to neutralise the smell, and are not as messy as putting baking powder in your shoe closet (which also does the same thing). 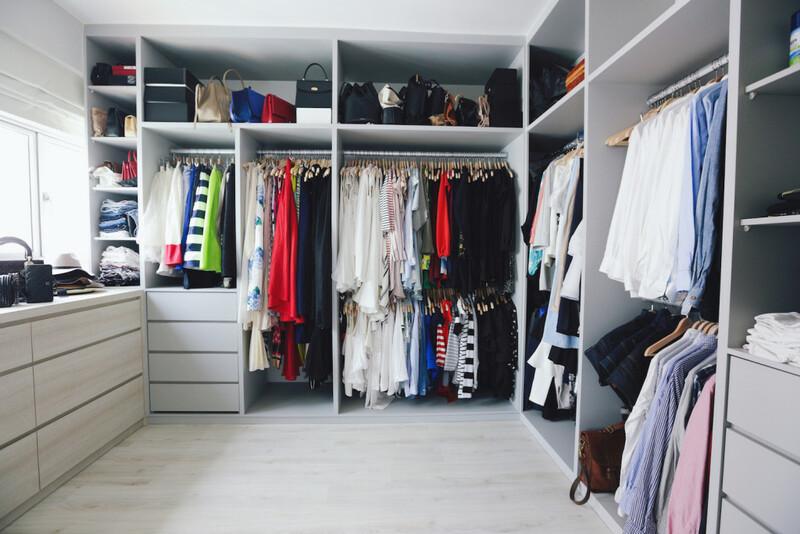 For winter clothes (or clothes you don’t wear as often), it’s best to store them in garment or storage bags and place them at the back or top of your wardrobe. Jessica uses black storage bags she got from her flying days (she used to be a flight attendant), but you can get similar ones from IKEA. If you’re especially OCD, you can store your winter clothes in vacuum-sealed compression bags (which can be found at Daiso or Qoo10). Vacuum-sealed bags typically prevent discolouration and moths from getting to your clothes, and as an added bonus, save a great deal of space too. Okay, confession time. What’s the ONE thing in your closet you refuse to throw out? This white dress! I was wearing it when Silas proposed to me, so it has a lot of sentimental value. I’ll never throw it out, even if it gets yellow and old. NEVER! How about the one thing you regret buying? 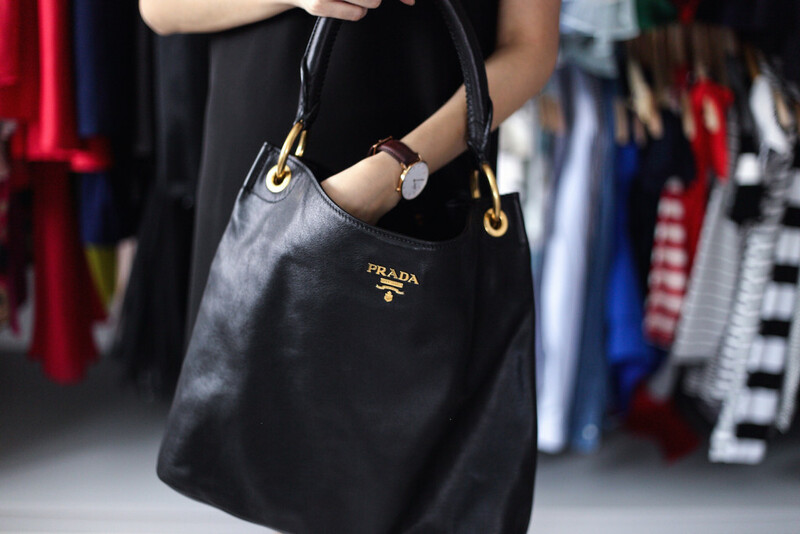 I bought a bag when I was at the Prada outlet in Europe, but on hindsight, I kind of regret it. I think I kind of psycho-ed myself into buying it because I thought, “Wah it’s so much cheaper! Better buy it!” but ended up not using it very often. 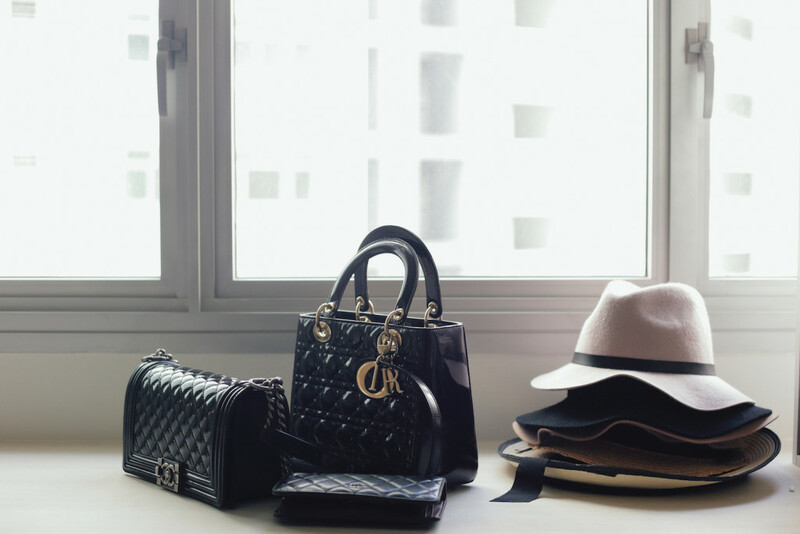 Lastly, what is your most prized possession in your closet? This is quite clichéd, but my most treasured item in my closet is this black Chanel Jumbo bag. I had been wanting it for the longest time and when I finally bought it, I was like “OMG YESSS!”. I love it because it’s so versatile – it’s formal enough for evening events, but also spacious enough to use in the daytime. It’s also in the caviar leather version, which is more durable than the smooth lambskin one. 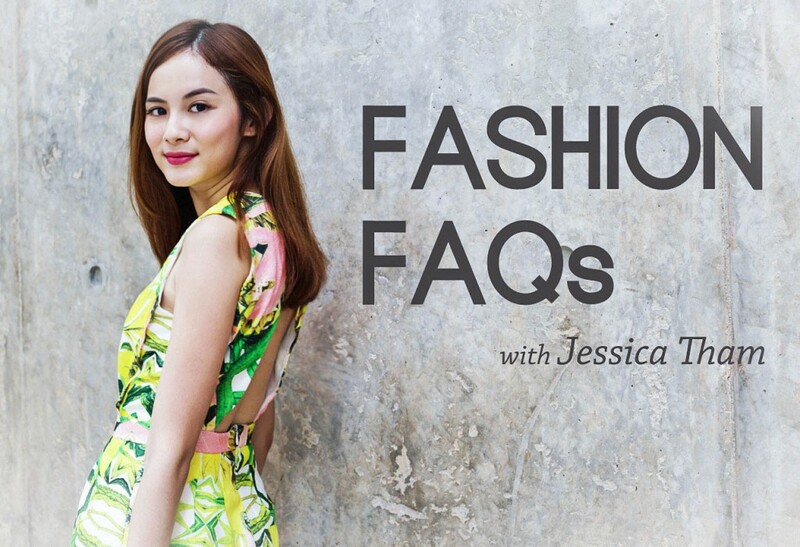 Check out Part Two: Wardrobe Essentials, where Jessica shares some of the things in her closet she can’t live without!